Dry & tickly cough relief. Colour & sugar free. The flavouring is apple. 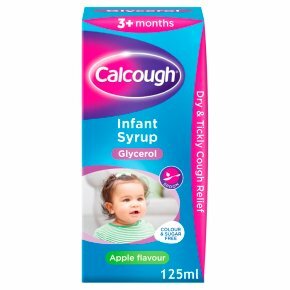 Glycerol What this medicine is for: Calcough® Infant Syrup is a soothing syrup which relieves the symptoms of: Dry coughs Tickly coughs What the medicine looks like Calcough® Infant Syrup is a colourless liquid available in 125 ml bottles. It contains 0.75 ml of the active ingredient, glycerol, in every 5 ml of medicine. Before giving this medicine to your child: This product is suitable for most people, but a few people should not use it. If you are in any doubt you should contact your doctor or pharmacist. Do not give your child this medicine: If they are under 3 months old. If they are allergic to any of the ingredients. How to use this medicine Check the information below to see how much medicine to give. For oral use only. Do not give more medicine that the carton (and/or label) tells you to. Children from 3 months to 5 years Age: Children 3 months to 1 year, How much: One 5 ml spoonful Age: Children 1 - 5 years, How much: Two 5 ml spoonful Give the dose 3 or 4 times within 24 hours, if needed. If symptoms persist for more than 3 days, consult your doctor. POSSIBLE SIDE-EFFECTS<br>This medicine is unlikely to cause side-effects unless your child is allergic to the ingredients. If your child experiences any side-effects or you are not sure about anything, talk to your doctor or pharmacist.<br><br>Reporting of side-effects: If you get any side-effects, talk to your doctor, pharmacist or nurse. This includes any possible side-effects not listed on this carton. You can also report side-effects directly via the Yellow Card Scheme at: www.mhra.gov.uk/yellowcard By reporting side-effects you can help provide more information on the safety of this medicine.<br><br>STORING THIS MEDICINE<br>Keep out of the sight and reach of children.<br>Keep the bottle tightly closed. Do not use after the end of the month shown as the expiry date on the packaging. Medicines should not be disposed of via wastewater or household waste. Ask your pharmacist how to dispose of medicines no longer required. These measures will help to protect the environment. Retain carton for full instructions.<br><br>Babies under 3 months<br>Do not give to babies under 3 months.<br><br>IF ANYONE HAS TAKEN TOO MUCH<br>If anyone has taken too much of this product, contact a doctor or your nearest Accident & Emergency Department (Casualty), taking this pack with you.<br>IF YOU FORGET TO GIVE THE MEDICINE<br>If you forget a dose, give the next dose when needed. DO NOT give a double dose.<br><br>TALK TO YOUR DOCTOR OR PHARMACIST<br>If your child has an intolerance to some sugars.<br>SOME OF THE INGREDIENTS CAN CAUSE PROBLEMS<br>This product contains maltitol. If you have been told by your doctor that your child has an intolerance to some sugars, contact your doctor before using this product. This should be taken into account in patients with diabetes.<br>Maltitol may have a mild laxative effect. Calorific value 2.3 kcal/g maltitol.